Organic leaders representing more than a half-million organic farmers throughout the Americas convened in Portland, Oregon, last week for the 9th Annual Inter-American Commission for Organic Agriculture (ICOA) Conference and discussed the latest research, challenges and opportunities for organic agriculture and trade in the Americas. This year's annual gathering marked the first time the conference was held in the United States and the first ICOA annual gathering hosted and organized by the U.S. Department of Agriculture and the Organic Trade Association. It drew the heads of national organic programs and organic trade leaders from 13 nations outside the U.S. spanning South and Central America. ICOA and its conference promote organic agriculture, equivalency, standards alignment and trade among participating countries. "The members of ICOA play an important role in the global organic industry," said Laura Batcha, CEO and Executive Director for the Organic Trade Association. "Nearly 20 percent of all organic land in the world is contained in the 19 member countries, along with some 600,000 organic farmers and operations. These countries are also active in the global organic market, with the U.S. importing around $750 million worth of organic products from this region last year." "There has never been a more essential time for organic industry representatives from the United States, Central America and South America to gather, collaborate and align," added Monique Marez, Director of International Trade at the Organic Trade Association. "We were delighted to serve as the host country and trade association. We look forward to taking part in an even more collaborative trade environment as a result of this highly productive conference." ICOA (identified in Spanish as CIAO) was established in 2008 by the Inter-American Institute for Cooperation on Agriculture (IICA). Its mission is to help support organic agriculture in the Americas by building ties with countries within the hemisphere that have organic regulatory systems and standards, and also to support countries establishing an institutional process to regulate organic agriculture. Nineteen countries are members of ICOA. Attendees at the Portland conference represented member nations with still fledgling organic sectors to ones with well-established organic systems--Argentina, Chile, Dominican Republic, Honduras, Panama, Ecuador, Guatemala, Paraguay, Peru, Mexico, Colombia, Spain, Costa Rica, and the United States. The organic sector in Central and South America is dominated by small family farmers, and those farmers are eager to obtain more educational information on organic agricultural practices and standards. The Organic Trade Association and the U.S. Department of Agriculture were praised for developing an informative agenda at the conference and providing attendees with useful tools that can be put into practice in their home countries. "There are currently few Spanish-language resources on organic practices and certification, so having the Organic Trade Association and the U.S. Department of Agriculture offer this depth of information and training is incredibly valuable," said Graciela Lacaze of Argentina, Executive Director of ICOA. "Attendees from both Spanish and Latin American countries came away with the tools necessary to strengthen the development of organic activity in their respective countries to further grow trade of their products." 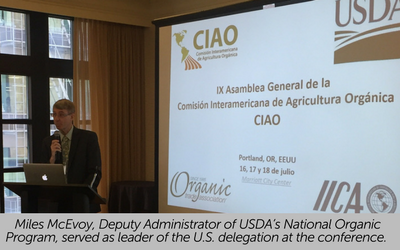 Leader of the U.S. delegation, Miles McEvoy, Deputy Administrator of the USDA's National Organic Program, noted that a strong global control system for organic depends on collaboration and coordination with the global community through bodies like ICOA. "We covered everything from organic benefits and equivalency standards to growth opportunities and trade arrangements at the ICOA meeting," said McEvoy. "Continuing this work with ICOA is a crucial piece in protecting organic integrity through the global control system. I look forward to building meaningful connections and creating lasting results." The week-long conference included three days of meetings of ICOA's General Assembly and a day-long public summit on international organic cooperation and trade within the Americas. Director of the Oregon Department of Agriculture Alexis Taylor addressed the ICOA General Assembly on the importance of organic agriculture to Oregon's farming community and to the state's overall economy, and on the commitment of Oregon to organic and to a strong regulatory system for organic. "Oregon has a long history of supporting organic agriculture through strong regulatory framework and protecting integrity for consumers," she said. Presenters at the public summit included Nate Lewis, Farm Policy Director for the Organic Trade Association, speaking on how to build organic farmer coalitions and encourage farmers to transition to organic; Dr. Jessica Shade, Director of Science Programs for The Organic Center, presenting the latest research on the benefits of organic; and Monique Marez who gave an update and analysis of global organic trade and imports. The group also heard presentations on organic certification from Oregon Tilth Certified Organic (OTCO) and on organic standards from the Organic Materials Review Institute (OMRI). 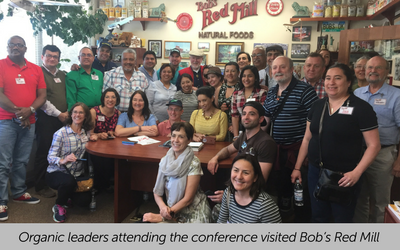 The conference ended with a day-long field trip to area organic producers and retailers, including visits to Organic Trade Association members Bob's Red Mill and New Seasons Market. Bob Moore, who founded Bob's Red Mill with his wife Charlee in 1978 to produce healthy, organic whole grain flour and products, met with the group. The group also toured a store of New Seasons Market, the Portland-based organic and natural food store which since 2000 has been serving communities in Oregon, Washington and Northern California. "The Organic Trade Association has worked hard to become the go-to source of information on international trade," said Marez. "We were excited to host this international meeting, and we'll continue to advocate for and help advance organic in the global community."